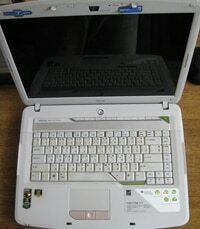 We have ACER Aspire 5520G, with AMD Turion Processor Dual-Core and Nvidia GeForce 8600GS graphic card. As we know the both processor and graphic card have a very high working temperature even in normal working conditions. But the things get bad when the dust is collected on the coolers and come to overheating of the chipset or the graphic card. The processor have built in overheat protection, so the two main components that get overheat are the chipset or the graphic card. In this case, we talk about the chipset. The symptoms are that the laptop is restarting all the time but don’t start (as we gonna see in the video). So, the procedure is this. We remove the cooler, clean the chipset and the processor and rework the chipset. After the chipset get cool down, we put a thin layer of silicone paste on the processor and the chipset. After that, we mount the cooler and we are ready for test run. Fortunately, the laptop is working. This was the case when we do rework of the chipset. When the graphic card is overheated, the symptoms are different. The laptop brighten the screen but there are lines in different colors, or the picture is grey. In this case, we do rework on the graphic card. The procedure is almost the same. Hi, ACER Aspire 5520 is one of the laptops that easy can make a rework on the chipset and to work again, but some times if the chipset was overheated a lot or after a couples of reworks, you need to do rebolling of the chipset. ACER Aspire have a Ati Radeon Graphic Card unlike the one that we have here – Nvidia. The ATI chips are more difficult to do a rework. The procedure is the same as we shown in the video. You can try to do the same as we do, if you have luck maybe you will fix your laptop. I have a 7520 which won’t boot. It appears from web searches the graphics chip is he issue. Is it worth ordering the proper sized BGA adaptor for the hot air gun? What is the best temperature to ruin this at? Hi there. In your case your laptop is 17″, but the motherboard is the same. Probably the issue is wit “CHIPSET” chip, not graphic chip. try first to do a rework of the chipset chip, how we do in the video and you will see if there are any changes. The temperature of the hot air that we work with is 400 Degrees Celsius. Some recommends that need to be lower (around 350) but there you will need more time to heat the chip. The time depends from the soldering material.